Why does the text say “for seven days you must eat with it unleavened bread”? This question has bothered many commentators because it creates a problem with the fact that the Pesach is only eaten during the first night, and must not be left to the next day! Another issue is the fact that the text says “from the flock (sheep and goats) or of the herd (oxen)”, but don’t we know from Exodus that the sacrifice comes only from the flock? From his own royal flocks and herds, Josiah supplied the people with 30,000 lambs and goats for the Passover sacrifice, as well as 3,000 cattle. His officials also willingly contributed to the people, priests, and Levites. Hilkiah, Zechariah, and Jehiel, the leaders of God’s temple, supplied 2,600 Passover sacrifices and 300 cattle. Konaniah and his brothers Shemaiah and Nethanel, along with Hashabiah, Jeiel, and Jozabad, the officials of the Levites, supplied the Levites with 5,000 Passover sacrifices and 500 cattle. Preparations were made and the priests stood at their posts and the Levites in their divisions as prescribed by the king. They slaughtered the Passover lambs and the priests splashed the blood, while the Levites skinned the animals. They reserved the burnt offerings and the cattle for the family divisions of the people to present to the Lord, as prescribed in the scroll of Moses. They cooked the Passover sacrifices over the open fire as prescribed and cooked the consecrated offerings in pots, kettles, and pans. They quickly served them to all the people. 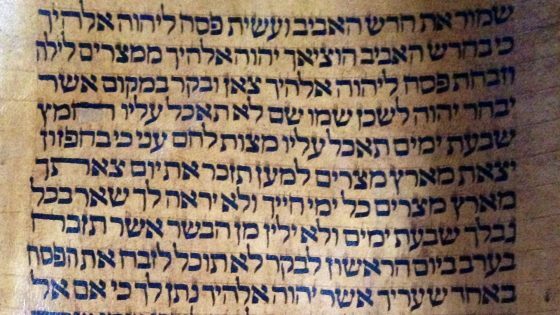 The writer of Chronicles knew they also had cattle in the ceremony and knew that the Torah adds cattle to the list, but he explained that it was for the Kodashim—sanctified sacrifices. This is very unusual because the Torah never says anywhere to have an extra sacrifice done that night (unless our text is the source for this). Moreover, from the text (if we ignore the seven days of not eating with it leaven issue) it sounds as if we can also use an ox for the Pesach! After thinking about it, I came back to the discussion that went on about the name Pesach and how it’s used today. Many people use the name Pesach to describe the whole feast and not just the first night. According to the context the verses are in, we are dealing with a description of the feasts—not the sacrifices. Because of this and the questions above, it could be, and I stress could be, that the name Pesach here is used as another name for Unleavened Bread, and not the Pesach sacrifice. If we go down this path then seven days of not eating leaven is the same as we have with all the rest of the appearances of the feast, and cattle in the sacrifices have to do with the feast celebrations and not the Pesach sacrifice. After saying all of this, we still have a problem. The rest of the text from verse 5 to the end talks very clearly that we are dealing with the Pesach sacrifice. But even then there are inconsistencies with the laws. In Exodus, the law of the Pesach says that we are not to cook the Pesach in water. The root used in Exodus is the same as used in Deut בשל. This is again a contradiction because the law is to roast צלה not בשל. Some link this to a change from nomadic tribes and city dwellers. Nomadic tribes live off of herds and mostly roast their food so they do not need pots and pans, while city dwellers also have cattle and cooking utensils. The laws of Pesach are completely changed in Deuteronomy. There is information missing or being confused in the text. There are some unusual grammar rules that are unique to this text that contradict any other rules. The first option is not really possible because we do see glimpses of the original law showing here and there. The second possibility is more reasonable and we have to admit to a problem in the structure of the text. The third option is plausible, but a whole research has to be done to prove it. It has to be proven that in one text we can skip from one topic to another without a form that introduces a new subject. With all I have said, I still stress that this is a work in progress and none of the above represents what I think about the Biblical text and is not a reason to change it. Also there is no reason to make any decisions based on what I have presented here.